That's what happened. And the ChangeLog entries for the past two weeks. All Federico's awesome optimizations are in there, plus a bunch more. 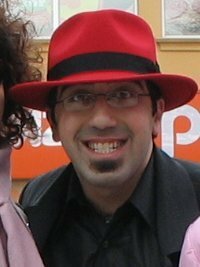 Red Hat Fedora Poll. Strangely, it's called Fedora Community Poll instead. Ah, by the way, became a Fedora Ambassador to Canada. Don't wait, become a Fedora ambassador to your area. Senko's missing piece of GNOME is funny. It would be cool to have a "Windows migration assistant" that keeps popping up balloons all over the place, shuffling your applets and icons every once in a while ;-). If I use this with GNOME 2.12, will bad things happen? Nothing bad happens. Update your glib and pango and rock. There's a pretty big performance bug in pango that is exposed when you click and drag to select text in the "Multiple Views" part of the GtkTextView part of gtk-demo. CPU goes to 100%. GtkTextView doesn't have this problem in the "Source" part of gtk-demo (using a fixed width font). Thanks for the report, but here is really not the best place to report bugs. Please file bugs on http://bugzilla.gnome.org/. In this case, I cannot reproduce the problem you are reporting using latest Gtk+ and Pango.